51. A and B together can finish a work in 30 days. They worked for it for 20 days and then B left the work. The remaining work was done by A alone in 20 days more. In how many days can A alone finish the work? Question 72.Study the pie-chart given and answer the following questions. Question 74. 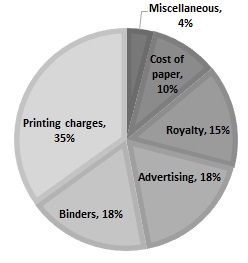 What should be the central angle of the sector 'cost of paper'? Question 76. In the following question, out of the four alternatives, choose the word which best expresses the meaning of the given word and click the button corresponding to it. Question 77. In the following question, out of the four alternatives, choose the word which is opposite in meaning to the given word and click the button corresponding to it. Light is _____ than sound. The man _____ for the purpose never did what was expected of him. There was a serious _____ between the two brothers. The boys absented themselves for two days. My mother insists on setting up something everyday for charity. He began on a new business venture. I have to say them the truth. The SSB will interview the candidate between 11 a.m. and 3.00 p.m. Settled life and cultivation gave man leisure; he had no longer to always think of getting food. During spare time he could make stone tools, hoes or pots and weave cloth. Some people spared from producing their own food could even devote themselves to other activities all the time. This resulted in a division of labour. The division of labour made it possible for various groups to specialize, that is, to acquire greater skill and learn better techniques in doing one kind of work. The settled community life needed rules to regulate the behaviour of the members of the community. It is not possible to know exactly how regulations were established. It appears that the decisions regarding the community were taken by the people as a whole, or by a council of elders, as is in the practice in tribal societies. There were perhaps no kings or any organized government. Most likely, there were chiefs elected by the community for their qualities of leadership. But, these chiefs could not pass their positions on to their sons and they enjoyed few special privileges. Archaeological excavations have not revealed anything which would indicate the prevalence of a higher status for some members of the community. This is also supported by the study of life in many tribes in modern times. Thus, social inequalities do not seem to have emerged even in Neolithic times. Question 96. What did man do in his spare time? Question 97. In the passage, "division of labour" means?